The CRI’s Jorge Andrade, PhD, and Sam Volchenboum, MD, PhD, will join colleagues from Nemours Alfred I. duPont Hospital for Children and Columbia University to present a tutorial session at the American Medical Informatics Association (AMIA) 2019 Informatics Summit this March. The tutorial, titled “A Bioinformatics Tutorial for Analyzing Whole Exome Sequencing: Unstructured Data to Variant Interpretation,” will be attended by clinicians, biologists, biomedical researchers, and students who are using or planning to use high-throughput genomics data in their research. It will provide an opportunity to run whole exome sequencing (WES) bioinformatics pipelines for processing raw fastq files into variant call files via the CRI’s high performance computing cluster, as well as hands-on examples for interpreting WES variant data using publicly-available resources. We are looking forward to joining our colleagues from other institutions and combining our expertise in bioinformatics analysis and high performance computing to offer a valuable experience to AMIA attendees. CRI Business Systems Analyst and resident REDCap expert Julissa Acevedo was recently invited to present for Vanderbilt University’s REDCapU, an online teaching tool to educate REDCap administrators so that they can better support their end users. Julissa presented on the topic of REDCap surveys for a webinar that was attended by 157 registrants from 120 institutions across 19 countries. Julissa shares her deep knowledge of REDCap with researchers here through the CRI Seminar Series, training materials, and personal consultations. The CRI is expanding our Pediatric Cancer Data Commons (PCDC) with a new pilot project in partnership with Leidos Biomedical Research, Inc.
As part of the National Cancer Institute (NCI)’s DI-Cubed data integration project, we are using our expertise in data harmonization to develop a process to integrate medical imaging resources into the International Neuroblastoma Risk Group (INRG) Data Commons. This proof-of-concept study will focus on MIBG scans, an important imaging modality for neuroblastoma patients. The DI-cubed Project is an effort to convert data from various clinical studies into a standardized format, and to demonstrate how this standardization can enable data from multiple studies to be combined, creating larger and more useful cohort sizes and making it possible to share data more easily between institutions. In addition to standardizing data from different sources, the project will bring together data from different domains, such as clinical data, imaging data, and genomic data. We are proud to contribute to this important national initiative. Read more about this project here. CRI Director Sam Volchenboum, MD, PhD, is contributing his substantial expertise in pediatric oncology and biomedical informatics to several high-profile committees and advisory boards this year. Sam has been appointed to two groups related to the National Cancer Institute (NCI) Cancer Research Data Commons (CRDC). He is a member of the Semantic Infrastructure Scientific Committee, a small committee that provides ongoing expert advice and direction for expanding the NCI’s Semantic Infrastructure to address the needs of the CRDC. He also serves on the Scientific and Technical Advisory Board for the CRDC. This Board provides input into the technical direction of the CRDC as well as guidance on how this important program can best serve the cancer research community. In September, Sam was invited to and participated in the Biden Cancer Summit in Washington, DC. This summit brought together leaders from across regions, sectors, and disciplines to strategize on the best ways to continue improving the culture of cancer care and research. Sam’s expertise is being recognized within the University of Chicago, as well. He currently serves as Chair of the Board of Computing Activities and Services, a faculty statutory board appointed by the Provost, as well as sitting on the Provost’s IT Committee, which reviews IT projects and recommends allocations of IT resources in support of the University’s mission and institutional priorities. Building on our successful past and current work with Thirty Million Words (TMW), the CRI is helping build a new community platform for the initiative. TMW, directed by Dr. Dana Suskind, is an innovative, evidence-based intervention program designed to create a population-level shift in the knowledge and behavior of parents and caregivers to optimize foundational brain development in babies and young children, particularly those born into poverty. Since the project began in 2014, the CRI’s applications development team has been a key collaborator in developing and supporting the informatics operations for TMW and associated studies. We are now expanding our work by building the infrastructure for the TMW Community Platform, a multi-year community-wide demonstration project that will implement TMW interventions through health and social service providers already working at scale in partner communities. Under the leadership of Director of Applications Development Brian Furner and Sr. Programmer Seong Choi, the CRI is working with a selected development partner and the TMW team to build a technical platform that will facilitate the delivery of TMW interventions and the collection of data for analysis. The platform includes a web application that supports community and user management, participant enrollment and consent, delivery of newborn interventional content, and a dashboard to monitor implementation. Our team is also developing reporting infrastructure for the platform, as well as a demo version of the application that will be used to train TMW’s implementing staff. We expect to deploy the TMW Community Platform in July 2019. We are happy to announce that ARTEMIS, the enterprise Clinical Trials Management System developed by the CRI for the University of Chicago, went live today. Beth Martell, Executive Director of the Office of Clinical Research, joined the CRI team in our offices as the first study was entered into the system. The CRI’s successful development of a Clinical Trials Management System (CTMS) for the University of Chicago continues on pace this autumn as we prepare for the launch of the system. After a year of iterative work to develop and test key components, the project is now in the final user acceptance testing phase and is set for deployment in mid-November 2018. Once the CTMS is in production, all new clinical trials at the University will be initiated within it. With our system, which includes a fully functional front end for budgeting and reporting in addition to managing clinical data, all information for University of Chicago clinical trials will be easily accessible in one place. The CRI has extended our relationship with Bad Rabbit Consulting and will continue to work closely with their research administration experts as we manage and further develop the CTMS after it is in production. We look forward to the successful deployment of this enterprise system that will unify, standardize, and modernize clinical research efforts across the BSD. The Gabriella Miller Kids First Data Resource Center has officially launched its Data Resource Portal, a powerful, open-source resource for research in pediatric disorders. The portal brings together clinical and genomic data related to childhood diseases, including pediatric cancer and birth defects, and enables researchers to collaborate with one another and analyze data in a secure, cloud-based environment. The CRI is committed to several efforts to use cross-institutional data sharing to study and combat diseases, especially rare diseases such as pediatric cancer. We are proud to be part of the development of this important resource, with our Sr. Programmer Luca Graglia, MS, fully dedicated to the project. Read more about the Kids First DRC and our role here. 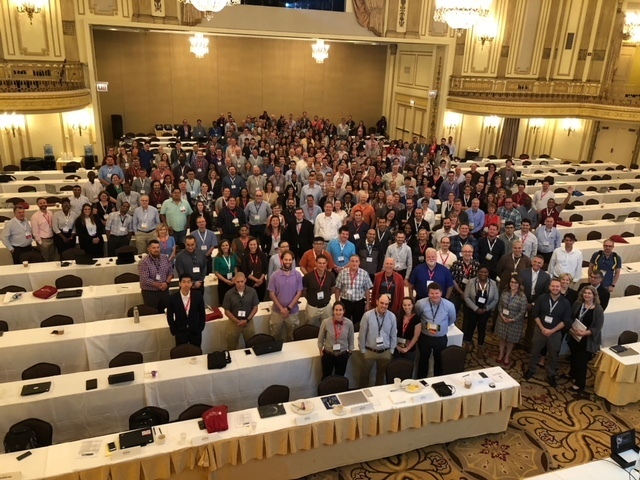 The CRI and University of Chicago wrapped up a successful REDCapCon last week. The CRI was honored to host this important three-day event, which brings together REDCap administrators and technical team members from institutions all over the world for education and networking. This year was the tenth annual meeting and one of the largest gatherings to date, with 327 attendees from 201 institutions representing 20 countries across 6 continents. Many members of the CRI, led by our REDCap Administrator Julissa Acevedo, contributed to planning and executing the event. The keynote speech was given by Dr. Julian Solway of the Institute for Translational Medicine. REDCapCon 2019 will be held in September 2019 in Vancouver, BC, Canada. The CRI Seminar Series 2018-19 season kicks off this Friday with a talk from Sam Volchenboum, “Including Informatics in Grant Applications.” The full schedule for this academic year includes twelve sessions, in topics ranging from parallel computing to natural language processing to REDCap. In October, we will welcome guest speakers from the Human Imaging Research Office; the other sessions will be presented by experts in each field from the CRI. Creating opportunities for informatics education is an important part of our mission. CRI Seminar Series talks are free and open to all members of the University of Chicago community and partner institutions. Check out the full schedule here.